or save any more images or files to the camera or memory card. In most cases, all or most of the data for the deleted pictures will still be contained on the memory card as long as nothing else has been saved to it in the meantime. You will probably be able to retrieve the deleted photos unless new files get saved to the card. At that point the likelihood of being able to successfully recover the deleted pictures begins to diminish rapidly. Have you deleted pictures from a camera and then later realised that you didn’t mean to? Depending on the circumstances, and what has happened since the pictures were deleted from the camera, then in many instances it is possible to retrieve the deleted photos from the camera and restore them. Virtually all modern digital cameras use memory card devices such as SD or CompactFlash cards to store the picture image data on a small chip contained inside them instead of on a disk drive as such. Some cameras also include a small amount of memory for storing a few additional pictures. The way that the digital picture image data is stored on, and retrieved from, a camera memory card is little different to a computer disk drive. Similarly, this includes what happens when photos are deleted from the camera. When you delete camera pictures, the photo image data itself is not deleted. All that happens is that the index record that tells the camera’s file management system where the data is stored on the camera card (or in its memory) is deleted. This means the camera now has no current record details of where the deleted pictures’ data is stored on the camera card. It also means that the memory space where deleted pictures were stored can now be used by the camera for saving new photos instead. As new pictures get saved onto the camera card the chances of some or all of the deleted pictures being overwritten increases. When this happens, it will no longer be possible to recover them. To retrieve deleted photos with the greatest degree of success, do not save any more images or files to the memory card. (if nothing else has been saved to it in the meantime). You will probably be able to retrieve the deleted photos until new files are saved to the card. Then it becomes much more unlikely you’ll be successful. It may also be possible to retrieve photos that have been deleted from a camera memory card even after a format of the card. However, some cameras deploy proprietary techniques for formatting and can wipe all traces of the files from the card, making it impossible to recover the deleted camera pictures. 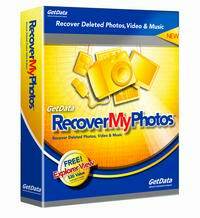 You can find out if the deleted pictures are still present on the camera, and if so whether or not they can be recovered, by trying the risk free demo version of the photo recovery software we recommend on this site. 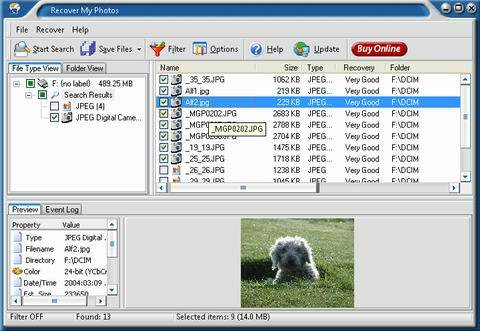 When you connect your camera or memory card to a PC and run the software, it will show you all the files it finds that can be recovered as easy to view thumbnail images so you can be totally confident of successful recovery. Click here for a simple illustrated Step-by-Step photo recovery procedure that you can follow to retrieve deleted photos from your camera.